Before knowing about its culture, we better understand what is Asmat Tribe first. Asmat is a tribe in Papua. Asmat tribe known for its unique wood carving. 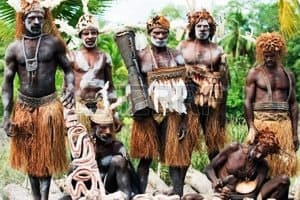 The Asmat population is divided into those who live on the coast and those who live in the interior. These two populations have their own characteristics and charms from one another in terms of dialect, way of life, social structure and ritual. Next is Wedding, this process applies to a 17-year-old male and female and is done by a male parent after both parties reach an agreement and through a test of courage to buy a woman with a dowry-based antique dish based on the value of the Johnson boat vessel agreement , If there is a deficiency in the Johnson boat price interpretation, then the men must pay it off and during the repayment period the man is prohibited from taking acts of persecution even though it is allowed to live in one roof. (Read also : Flag of Indonesia – Indonesia Military Power). The boat he had, drowned. In the fierce fighting that occurred, he could kill the crocodile, but he was seriously injured. He was carried away by the flow that stranded him on the banks of the Asewetsy River, the present is Syuru village. Luckily, there was a Flamingo bird who looked after him until he recovered; Then, he built a yew house and carved two very beautiful statues and made an em drum, which was very strong. After he finished, he began to dance continuously without stopping, and the magical power that came out of his movement gave life to the two statues he carved. Soon the statues began to move and dance, and they later became the first human couple, the ancestors of the Asmat. 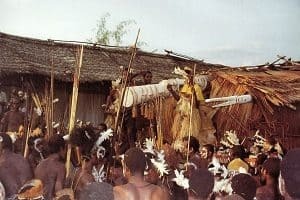 Until the late 20th century, Asmat’s youths fulfilled their duties and devotion to their fellow members, to their ancestors and at the same time proved their virility by bringing their enemy’s head while his body was offered to eat by other family members in the village. Every 5 years, Asmat people make new boats. In the process of making boat to finish, there are things to note. After the tree is selected, cut down, peeled and tapered at both ends, the rod is ready to be transported to the boat making. Meanwhile, the handles for holding straps and ropes are prepared. The abstinence to watch while working on it all is not to make a lot of the sounds around the wrought. 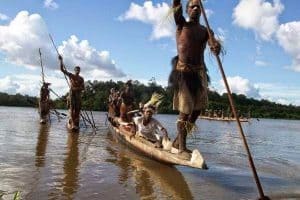 The Asmat people believe that if the log is stepped before it is pulled into the water, it will gain weight so it can not be moved. To pull the log, the boat owner asked for help from his relatives. A small part will drive the wood in the back and the rest pull the wood. Previously held a special ceremony led by an influential elder in the community. The point is that the boat will run well and smoothly. 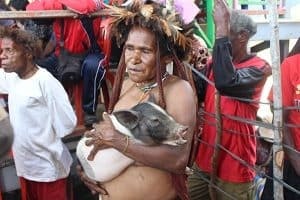 Bis ceremony is one of the important events in the life of the Asmat tribe because it is related to carving the statue of the ancestors (bis) when there is demand in a family. In the past, this bis ceremony was held to commemorate the family members who had been killed, and the death must be avenged by killing family members of the killing party. To make a statue of ancestor or brother who has died required approximately 6-8 weeks. The carving of the statue is done inside the long house (bujang) and during the making of the statue takes place, the women are not allowed to enter the house. In the making of bis statues, there is usually a wife exchange called papis. This action intends to cultivate an indispensable friendship relationship at a certain moment, such as warfare. The choice of spouse occurs during the ceremony of war between women and men held every afternoon. Asmat people have 2 types of houses, namely family home and bujang (je) house. This bujang house is very important for Asmat people. This bujang house is named after the clan (family) of the owner. The bujang house is a center of activity both religious and nonreligious. A family can live there, but if there is a planned raid or ceremonies, women and children are barred from entering. The Asmat perform special ceremonies for the new bujang house, which is attended by family and relatives. The making of a bujang house is also followed by several people and the ceremony is performed with dance and tifa. 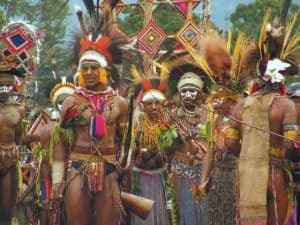 That’s it the Culture Asmat Tribe. So what do you think about it? 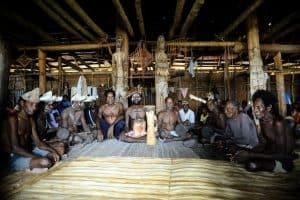 We must agree that Asmat has a rather unique custom that can’t be found anywhere else. And its a good point, to add the uniqueness of Indonesia itself. Thanks to that, Indonesia becomes more “special” in our heart. That’s it, have a good day!